An 11-year-old football fan has been allowed to fly an England flag from his bedroom in south Wales after initially being told to take it down. Sam Struebig was told to remove the two-foot flag from his bedroom window in Penarth, because it contravened the terms of the flat's lease. His mother said Sam was "upset that someone thought he'd offended them". 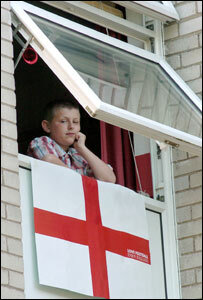 But following a meeting of the Cogan Court directors, Sam was allowed to put the flag back in his bedroom window. Sam's Cross of St George, which came with a newspaper, was displayed inside a second floor window at Cogan Court flats. His mother, Sarah Cardownie, said they were sent a letter telling them to take the flag down following a complaint by another resident. She said: "We had the flag with a newspaper and to support the World Cup my son put it up in his window. "We had a letter from the management committee asking us to take the flag down. Somebody had found it offensive." Ms Cardownie added: "He (Sam) gets very upset thinking he's in trouble so he ran and took the flag down straight away. "He was just upset that someone thought he'd offended them. "I thought it was a joke - I thought the world's gone mad if you can't put an England flag for the couple of weeks the World Cup is on." But following a meeting of the directors of the Cogan Court management company, it was decided Sam would be allowed to fly his flag. The company said the 11-year-old had originally been asked to remove it from the window but it had been later agreed he could put it back up. Ms Cardownie said: "It's fun at the end of the day we are showing our support for the only British team left in there."